The pancreas is a pinkish white glandular organ found in vertebrates near the stomach and small intestine. The pancreas is the second largest gland that is connected to the digestive tract, after the liver. The pancreas is one of the few organs that has both an exocrine and an endocrine function. Exocrine glands are glands that secrete their products into ducts (duct glands). Endocrine glands are glands that secrete their product directly into the blood rather than through a duct. The pancreas' exocrine function involves the secretion of bicarbonate and digestive enzymes into the small intestine. Its endocrine function involves the regulation of blood sugar levels by secreting the hormones insulin, glucagon, and somatostatin directly into the blood. The endocrine portion of this organ consists of about 1 million islets of Langerhans, amounting to only 1-3 percent of the organ weight. The majority of cells are exocrine and secrete one to three liters of digestive fluid per day. The pancreas is an important organ for digestion and the control of circulating levels of glucose. This organ is an excellent example of an intricate, well-tuned organ that functions in harmony with other parts of the body, providing a service to the body while receiving the nutrients and removal of wastes necessary for its survival. For example, in terms of its function in the digestive system, it is one of several parts of the body that work together, involving cooperative giving and receiving, including the stomach, intestines, liver, pancreas, heart, brain, and so forth. Seventeenth century, the main duct of the pancreas was described by Dr. Wirsung. 1846, Claude Bernard discovered that the pancreas had a role in the digestion of fats in rabbits. 1889, Reginald Fitz discovered pancreatitis as a disease. 1922, Banting and Best made the Nobel prize–winning discovery that the pancreas contained a substance that could cure diabetes in dogs. In human beings, the pancreas is a 6-10 inch elongated organ weighing 65 to 160 grams and lying in the abdominal cavity. It lies posterior to the stomach, anterior to the kidneys, and empties into the duodenum portion of the small intestine. 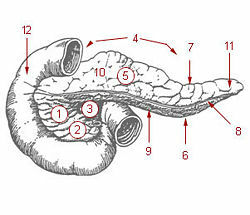 The human pancreas can be divided into five regions: (1) the head, which touches the duodenum, (2) the body, which lies at the level of second lumbar vertebrae of the spine, (3) the tail, which extends towards the spleen, (4) the uncinate process, and (5) the pancreatic notch, which is formed at the bend of the head and body. 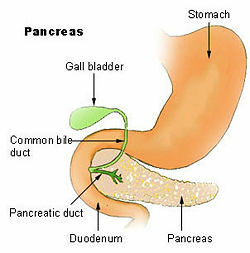 The pancreatic duct or duct of Wirsung runs the length of the pancreas and empties into the duodenum at the ampulla of Vater. The common bile duct usually joins the pancreatic duct at or near this point. Many people also have a small accessory duct, the duct of Santorini, which extends from the main duct more upstream (towards the tail) to the duodenum, joining it more proximally than the ampulla of Vater. Venous drainage is via the pancreaticoduodenal, veins which end up in the portal vein. The splenic vein passes posterior to the pancreas but is said to not drain the pancreas itself. The portal vein is formed by the union of the superior mesenteric vein and splenic vein posterior to the neck of the pancreas. In about 40 percent of people, the inferior mesenteric vein also joins with the splenic vein behind the pancreas; in most people it simply joins with the superior mesenteric vein instead. The pancreas receives neural innervation from the vagus (cranial X). This is part of the autonomic parasympathetic supply. The role of the vagus is to stimulate secretion of the pancreatic digestive juices. Autonomic sympathetic nerves to the pancreas derive from the celiac ganglionic plexus, the superior mesenteric plexus, and the hepatic plexus. These plexuses lie outside the pancreas and send postganglionic fibers into the pancreatic cells. These sympathetic nerves inhibit the production of digestive enzymes (Berne et al. 1996). Many different neurotransmitters have been found within the pancreas including acetylcholine, epinephrine, norepinephrine, serotonin, nitric oxide, and others (Salvioli et al. 2002). When the pancreas is sliced, stained, and then viewed with a microscope, it is easy to distinguish many different types of cells that correspond to different pancreatic functions. The microscopic appearance of the pancreas shows a series of islands (the Islets of Langerhans) consisting of small cells packed closely together, surrounded by much larger and less dense acinar cells. The islands have an endocrine function and the surrounding cells have an exocrine function. The acinar cells of the pancreas are arranged in such a way as to form a compound acinous gland. The smallest unit is the lobule, which is composed of single layers of acinar cells dumping their contents into a tubule, which is closed at one end. These lobules drain into larger intercalated ducts, which drain into larger intralobular ducts, which drain into extralobular ducts. These join one of the two main ducts; the larger duct of Wirsung or the smaller duct of Santorini. There are two types of exocrine cells lining each lobule : (1) acinar cells and (2) centroacinar cells. The cells at the closed end of the lobular tube are called acinar cells. As the lobule merges with the intercalated duct the centroacinar cells predominate. The acinar cells have a pyramidal shape and contain a high concentration of enzymes in the form of zymogen storage granules. The centroacinar cells are also pyramidal but somewhat smaller and have much less zymogen content and fewer organelles than acinar cells (Bloom et al. 1972). The cells that line the intercalated ducts change from centroacinar to a simple columnar type and are believed to be the source of the aqueous bicarbonate rich secretions. The islets are a compact collection of endocrine cells arranged in clusters and cords that are crisscrossed by a dense network of capillaries. The capillaries are lined by layers of endocrine cells in direct contact with them by either cytoplasmic processes or by direct apposition. The cells release their hormones, without ducts, directly into the capillaries. Insulin is a polypeptide containing two chains of amino acids joined together by two disulfide bridges, and contains a total of 51 amino acids. helps to transport glucose into skeletal muscle and liver. is produced when blood sugar exceeds 50 mg/deciliter. has an average production of 1.0 to 2.5 mg/day. stimulates skeletal muscle and liver to convert glucose to a storage form called glycogen. stimulates fat cells to synthesize fat. acts on the hypothalamus to reduce appetite. Amylin is another polypeptide secreted by the beta cells. It is slightly smaller than insulin with 37 amino acids. It works to supplement the actions of insulin. inhibits the secretion of glucagon. lowers the level of glucose in the blood. slows the emptying of the stomach into the intestine. sends a signal of satiety to the brain. Glucagon is a polypeptide containing 29 amino acids. secretion is inhibited by amylin (Bowen 2002). The endocrine function of the pancreas is to produce important hormones including insulin, glucagon, and somatostatin and export them to the blood supply on demand. Somatostatin is a polypeptide secreted by the delta cells and consists of 12 amino acids. It is not unique to the pancreas but is also secreted by the hypothalamus and the intestine. The intestine secretes another form consisting of 28 amino acids. It works to inhibit the secretion of several other hormones. Its main action in the pancreas is to inhibit the secretion of both insulin and glucagon in addition to suppressing the exocrine secretions of the pancreas (Bowen 2002). Pancreatic polypeptide is secreted by the gamma cells and consists of 36 amino acids. It is produced in response to chewing and swallowing food. It probably acts to reduce appetite (Taylor et al. 1982). There are two main types of exocrine pancreatic secretions: (1) the aqueous alkaline type, which is rich in bicarbonate ions, and (2) the enzyme rich type. Secretin and cholecystokinin (CCK) are two hormones released by the mucosal cells of the duodenum, whose effect on the pancreas is to stimulate the production of aqueous alkaline and enzymatic secretions, respectively. The aqueous alkaline component of bicarbonate ions from the pancreas is at a much higher concentration than plasma (hypertonic) and varies from 70 meq./L. to about 150 meq./L. As it flows down the ducts toward the duodenum, water enters the ducts to make the bicarbonate concentration isotonic. At the same time, chloride ions migrate into the ducts and bicarbonate ions migrate out. Pancreatic juice also contains ions of calcium, magnesium, hydrogen phosphate, and sulfate. This alkaline mixture eventually empties into the duodenum to neutralize the acids received from the stomach. Although chloride ion migration into the pancreatic ducts may seem to be of minor importance, it is now known that a defect in the chloride channel that prevents this migration causes a disease known as cystic fibrosis. The pancreatic ducts and the lung airways become clogged with mucus and result in difficulty in breathing and digesting fats (Berne et al. 1996). Trypsinogen becomes activated to trypsin by enteropeptidase (enterokinase) produced in the duodenum. The trypsin that has formed then activates more trypsinogen as well as chymotrypsinogen, procarboxypeptidase and proelastase. The main starch digesting enzyme is pancreatic alpha amylase and it is released into pancreatic ducts in its active form. The cofactor colipase combines with some lipases to lower the pH optimum. Another category of enzymes produced by the pancreas are the nucleases. Ribonuclease digests RNA and deoxyribonuclease digests DNA. Researchers are continually discovering more about Diabetes and likely causes for the disease. Diabetes was assumed to be a type of autoimmune disease in which the body's immune system attacked the beta cells to destroy insulin production, but a new discovery in 2006 might have important implications for the treatment of diabetes. Drs. Michael Salter and Hans Dosch at the Toronto Hospital for Sick Children noticed the presence of pain neurons in the islets of Langerhans of mice that were type I diabetic. They injected capsaicin into these mice, in an attempt to destroy these pancreatic pain neurons. Almost immediately, the mice began producing insulin normally. This treatment reduced the development of diabetes in these mice by 80 percent. When the researchers injected the diabetic mice with sensory neuropeptide, they were cured overnight of diabetes, for as long as 4 months, suggesting a link between neuropeptides and the development of diabetes. Also, insulin resistance (characteristic of type 2 diabetes) was reduced. These research results are in the process of being confirmed as well as the research results of numerous other ongoing diabetes studies, and their applicability to human beings is awaited anxiously (Blackwell 2006). Lymphatics of stomach, etc. The stomach has been turned upward. Pancreas of a human embryo of five weeks. Pancreas of a human embryo at end of sixth week. Front of abdomen, showing surface markings for duodenum, pancreas, and kidneys. Blackwell, T. 2006. Diabetes breakthrough: Toronto scientists cure disease in mice. National Post on Canada.com. Retrieved June 10, 2007. Bloom, W., and D. W. Fawcett. 1972. A Textbook of Histology, 10th ed. Philadelphia: W. B. Saunders. ISBN 0721617573. Bowen, R. 2002. The endocrine pancreas: Introduction and index. Colorado State University. Retrieved June 10, 2007. Busnardo, A. C., L. J. DiDio, R. T. Tidrick, and N. R. Thomford. 1983. “History of the pancreas.” Am J Surg 146(5): 539-50. Harper, D. 2007. Pancreas. Online Etymology Dictionary. Retrieved April 4, 2007. Salvioli, B., M. Bovara, G. Barbara, F. O. De Ponti, V. Stanghellini, M. Tonini, S. Guerrini, C. Cremon, M. Degli Esposti, M. Koumandou, R. Corinaldesi, C. Sternini, and R. De Giorgio. 2002. Neurology and neuropathology of the pancreatic innervation. JOP. J. Pancreas, 3(2):26-33. Taylor, I. L., and M. Feldman. 1982. Effect of cephalic-vagal stimulation on insulin, gastric inhibitory polypeptide, and pancreatic polypeptide release in humans. Journal of Clinical Endocrinology & Metabolism, 55: 1114-1117. This page was last modified on 19 March 2015, at 16:07.